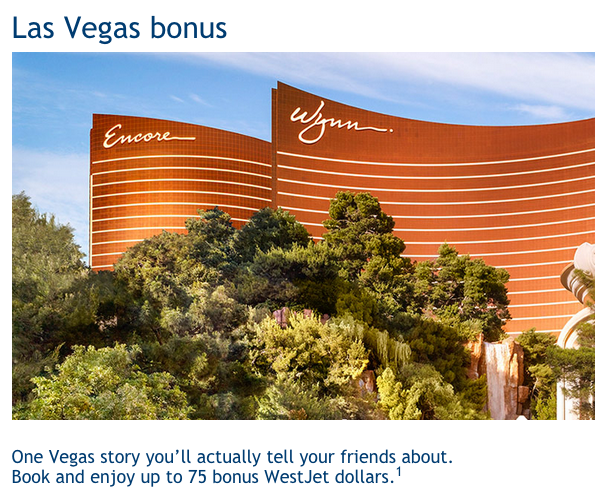 WestJet Rewards has brought back their ever popular Las Vegas bonus. There are two parts to the offer, a flight only bonus and a flight+hotel booking bonus. The flight only offer is huge: 50 bonus dollars on round trip flights to Vegas. Book a flight and a 2 or more night stay at the Wynn Las Vegas or Encore booked via WestJet Vacations and you'll earn a total of 75 bonus WestJet dollars. And why not make your WestJet travels even more rewarding and enjoyable by taking advantage of our Exclusive offer for WestJet Rewards Silver Status when you apply for and receive the WestJet RBC World Elite MasterCard!